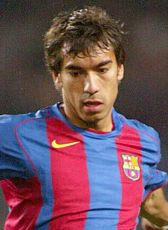 Gio joined Barcelona on loan from Arsenal for the 2003-2004 season. At the end of his successful loan-period, he signed a 3-year permanent deal. Close to the end of his successful 3-years period, he extended with another season until 2008. He returned home in June 2007, to his former club Feyenoord. There was an option in his Barça contract that allowed him a free transfer to Feyenoord only. He signed a 3-year contract. In the summer of 2010, Van Bronckhorst retired from professional football after playing the Worldcup final against Spain winning his 106th cap. After his retirement as player, he continued his football career as coach and assistant manager at Feyenoord Rotterdam. Since May 2015 Giovanni van Bronckhorst is the head coach of Feyenoord.